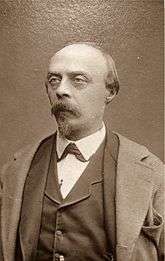 Baron Hans Guido von Bülow (January 8, 1830 – February 12, 1894) was a German conductor, virtuoso pianist, and composer of the Romantic era. One of the most famous conductors of the 19th century, his activity was critical for establishing the successes of several major composers of the time, especially Richard Wagner and Johannes Brahms. Alongside Carl Tausig, Bülow was perhaps the most prominent of the early students of Hungarian virtuoso pianist, conductor and composer Franz Liszt. He became acquainted with, fell in love and eventually married Liszt's daughter Cosima, who later left him for Wagner. Noted for his interpretation of the works of Ludwig van Beethoven, he was one of the earliest European musicians to tour the United States. Bülow was born in Dresden, to members of the prominent Bülow family. From the age of nine, he was a student of Friedrich Wieck (the father of Clara Schumann). However, his parents insisted that he study law instead of music, and they sent him to Leipzig. There he met Franz Liszt, and on hearing some music of Richard Wagner—specifically, the premiere of Lohengrin in 1850—he decided to ignore the dictates of his parents and make himself a career in music instead. He studied the piano in Leipzig with the famous pedagogue Louis Plaidy. He obtained his first conducting job in Zurich, on Wagner's recommendation, in 1850. Bülow had a strongly acerbic personality and a loose tongue; this alienated many musicians he worked with. He was dismissed from his Zurich job for this reason, but at the same time he was beginning to win renown for his ability to conduct new and complex works without a score. In 1851, he became a student of Liszt, marrying his daughter Cosima in 1857. They had two daughters: Daniela, born in 1860 and Blandina, born in 1863. 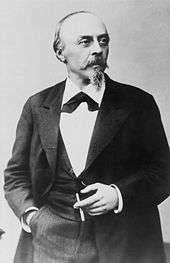 During the 1850s and early 1860s he was active as a pianist, conductor, and writer, and became well known throughout Germany as well as Russia. In 1857, he premiered Liszt's Piano Sonata in B minor in Berlin. In 1864 he became the Hofkapellmeister in Munich, and it was at this post he achieved his principal renown. He conducted the premieres of two Wagner operas, Tristan und Isolde and Die Meistersinger von Nürnberg, in 1865 and 1868 respectively; both were immensely successful. Meanwhile, however, Cosima had been carrying on an affair with Richard Wagner and gave birth to their daughter Isolde in 1865. Two years later, they had another daughter, Eva. Although Cosima and Wagner's affair was now open knowledge, Bülow still refused to grant his wife a divorce. Finally, she gave birth to one final child, a son Siegfried and it was only then that the conductor at last relented. Their divorce was finalized in 1870, after which Cosima and Wagner married. Bülow never spoke to Wagner again and he did not see his former wife for 11 years afterwards, although he apparently continued to respect the composer on a professional level, as he still conducted his works and mourned Wagner's death in 1883. In July 1882 he married the actress Marie Schanzer. In 1867 Bülow became director of the newly reopened Königliche Musikschule in Munich. He taught piano there in the manner of Liszt. He remained as director of the Conservatory until 1869. Bülow's students in Berlin included Asger Hamerik and Joseph Pache. In addition to championing the music of Wagner, Bülow was a supporter of the music of both Brahms and Tchaikovsky. He was the soloist in the world premiere of the Tchaikovsky Piano Concerto No. 1 in B-flat minor in Boston in 1875. He was also a devotee of Frédéric Chopin's music; he came up with epithets for all of Chopin's Opus 28 Preludes, but these have generally fallen into disuse. On the other hand, the D-flat major Prelude No. 15 is widely known by his title, the "Raindrop." (The complete list of titles is given in Schonberg 1987, pp. 136–37). He was the first to perform (from memory) the complete cycle of Beethoven's piano sonatas, and with Sigmund Lebert, he co-produced an edition of the sonatas - which is still in print. From 1878 to 1880 he was Hofkapellmeister in Hanover but was forced to leave after fighting with a tenor singing the "Knight of the Swan [Schwan]" role in Lohengrin; Bülow had called him the "Knight of the Swine [Schwein]". In 1880 he moved to Meiningen where he took the equivalent post, and where he built the Meiningen Court Orchestra into one of the finest in Germany; among his other demands, he insisted that the musicians learn to play all their parts from memory. It was during his five years in Meiningen that he met Richard Strauss (though the meeting actually took place in Berlin). His first opinion of the young composer was not favorable, but he changed his mind when he was confronted with a sample of Strauss's "Serenade". Later on, he used his influence to give Strauss his first regular employment as a conductor. Like Strauss, Bülow was attracted to the ideas of Max Stirner, whom he reputedly had known personally. In April 1892 Bülow closed his final performance with the Berlin Philharmonic (where he had been serving as Principal Conductor since 1887) with a speech "exalting" the ideas of Stirner. Together with John Henry Mackay, Stirner's biographer, he placed a memorial plaque at Stirner's last residence in Berlin. Some of his orchestral innovations included the addition of the five-string bass and the pedal timpani; the pedal timpani have since become standard instruments in the symphony orchestra. His accurate, sensitive, and profoundly musical interpretations established him as the prototype of the virtuoso conductors who flourished at a later date. He was also an astute and witty musical journalist. In the late 1880s he settled in Hamburg, but continued to tour, both conducting and performing on the piano. Bülow suffered from chronic neuralgiforme headaches, which were caused by a tumor of the cervical radicular nerves. After about 1890 his mental and physical health began to fail, and he sought a warmer, drier climate for recovery; he died in a hotel in Cairo, Egypt at the age of 64, only ten months after his final concert performance. "A tenor is not a man but a disease". To a trombonist: "Your tone sounds like roast-beef gravy running through a sewer". Upon being awarded a laurel wreath: "I am not a vegetarian". "Always conduct with the score in your head, not your head in the score". "Bach is the Old Testament and Beethoven the New Testament of music". "In the beginning was rhythm". ↑ Regarding personal names: Freiherr was a title before 1919, but now is regarded as part of the surname. It is translated as Baron. Before the August 1919 abolition of nobility as a legal class, titles preceded the full name when given (Graf Helmuth James von Moltke). Since 1919, these titles, along with any nobiliary prefix (von, zu, etc. ), can be used, but are regarded as a dependent part of the surname, and thus come after any given names (Helmuth James Graf von Moltke). Titles and all dependent parts of surnames are ignored in alphabetical sorting. The feminine forms are Freifrau and Freiin. ↑ Marek, George R. (1967). Richard Strauss - The Life of a Non-Hero. London: Gollancz. p. 52. ISBN 0-575-01069-X. ↑ The quotation is out of context. Walker p. 175 wrote "To pianists he said 'Bach is the Old Testament and Beethoven the New Testament of music'". Walker gives no further reference for this, but as von Bülow had done an edition of Beethoven's piano sonatas which remains in print even now, it is not surprising in context. Large domains of music, such as opera, which might seem to be neglected by the out-of-context quote, are not relevant in advice to pianists. Holden, Raymond (2005). The Virtuoso Conductors: The Central European Tradition from Wagner to Karajan. New Haven, Conn.: Yale University Press. ISBN 0-300-09326-8. Fifield, Christopher. Macy, L., ed. Hans von Bülow. Grove Music Online. Walker, Alan (1993). Franz Liszt: The Weimar Years, 1848–1861. Ithaca, NY: Cornell University Press. ISBN 0-8014-9721-3. Walker, Alan (2009). Hans von Bülow: A Life and Times. Oxford, England: Oxford University Press. ISBN 978-0-19-536868-0. Warrack, John; Sadie, Stanley ed. (1980). "Hans von Bülow". The New Grove Dictionary of Music and Musicians. 20. London: Macmillan Publishers Ltd. ISBN 1-56159-174-2.